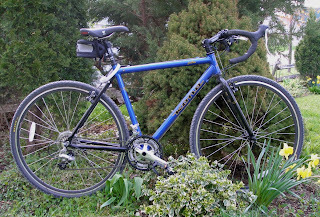 This February, emboldened by my visit with the good folk at Natural Cycle, I determined to disassemble my trusty old bicycle and give it the sophisticated attention it so desperately needed. I took the bike into the basement, pulled out my tools and carefully laid them out the way a surgeon might. Then I retrieved my manuals and set them beside the tools. I considered my first move. Then I reconsidered. Why not see what it would cost to get a pro to do this? I took it to my local outfitters, and asked. "So you want a basic overhaul?" he said. "Well, certainly that. But there are a few other things I'll need as well." I began to enumerate, and watched as his eyes glazed over. "Well ... I can do that," he said, once I finished my list. "I have to give you fair warning, though. Here's what it's going to cost, not including parts replacement." He told me. It was time for my eyes to glaze over. I cleared my throat and said, "Remember that bike we talked about last spring? It's a cyclocross model." "That's the one. What's the sticker price?" "Actually, I've got two left over from last season that I'm trying to get rid of." "Any chance one of those might fit me?" I asked. "Oh, there's a pretty good chance, I'd say...."
"The honor accorded to the image passes over to its prototype, and whoever adores the image adores in it the reality of what is there represented" -- The Doctrine of the Veneration of Icons, formulated in 787 by the Seventh Ecumenical Council (Wiki). I am not old enough to remember Martin Luther King Junior -- I was a few months away from turning three when his life was taken. He is an icon for me. Usually the buffer of time coinciding with an absence of formative memory serves to remove the threat and demand for transformation that an icon invariably represents. No such buffer exists with this man. Icons, like King or the Dalai Lama, are maddening figures who make rigorous and maddening claims about humanity's shared existence. The degree to which we shrug off and dismiss these claims is the degree to which we commit ourselves to mediocrity, blinkered self-congratulation and wanton cruelty. I would like to say more about King, but I am still wrestling with what he represents -- unlike, say, the North American media, which still does not hesitate to put a black preacher "in his place." From Jon Trott, who remembers. Maude Newton has once again pulled together some winner lit-links. She begins with this Peter DeVries quote -- “You can’t talk about the serious and the comic separately and still be talking about life, any more than you can independently discuss hydrogen and oxygen and still be talking about water” -- and concludes with this Guardian interview with Marjane Satrapi. When it comes to the bond between the serious and the comic, it couldn't get any tighter than it is in Ms. Satrapi's Persepolis, which my wife and I finally got to see this weekend. We thought it was a lovely, giggle-inducing and heartbreaking movie and give it our highest recommendation. These are not the only excellent links Ms. Newton has discovered, so head over there "toot sweet" and check 'em out. Christian Punk is available as a podcast. You can download it here, or if you prefer to stream it, go here. The file is 21 minutes long. That's the last of 'em, for a little while at least. I've been tinkering with a larger project (I can't quite bring myself to say I'm "working" on it, since that would imply actual work on my part). I may throw a few snippets out, if only to get a sense of my authorial voice. Which leads me to say: writer types could do worse than record themselves reading their work. Before I published these stories, I of course read them aloud to my long-suffering wife. She helped me edit them, then we published. Reading these stories into the mic one year later, I uncovered more than a few gaffs I wish had never slipped out into the public. So it goes. I'll make a few changes to the book (including Michael B's recommended "one space between sentences"), then have done with it. My apologies to completists (*cough* ... sorry, Mum). In yet another cosmetic attempt to persuade myself of my vitality, I threw caution to the wind and hit “Place Your Order.” Less than a week later, my T-shirt arrived in the mail (no skulls this time — those are for kids). I took a deep breath, let it out, then donned the shirt. Wonder of wonders, it fit! I'm still a “Medium”! Or am I? I'll admit the shirt is a little tighter around the middle than I'd like, but there's still room to move, if not grow. In terms of fit, it's not unseemly for me to wear the shirt. But the fact of the matter is this is the winter I “hit the deuce” and nudged the scale's meter over the 200 lbs mark. And yet I'm wearing jeans with a 34-inch waistline. I had a 34-inch waistline when I got married 15 years — and 50 lbs — ago. What's going on here? Following a hunch, I went to the basement and foraged through our collection of paint rags. At the very bottom lay my old Hendrix shirt — a “Medium” I'd purchased and worn 20 years ago. I laid it over top of my new shirt, and sure enough, “Medium” has indeed been super-sized into a “Large.” Ditto, with a ragged pair of blue jeans: no matter how I sucked in my gut, the button would not close. The label on the jeans might lie, but the tape measure does not: my waistline is 40 inches, end of story. I mentioned this experiment to my wife (who remains lithe enough to fit into her wedding dress). She told me about some clothes she'd purchased online from a US outfit a year ago. She'd used her correct measurements, but when the clothes arrived and she put them on, she found she was swimming in them. “If the clothes are being manufactured for North Americans, they're being made much larger than the label admits,” said she. This is a trend that I find vexing, and not a little depressing. Vexing because the next time I order a T-shirt in “Medium” I just might get what I asked for (in which case I'll have to persuade one of my daughters to wear it). And depressing because ... well, geez: I'm a 43 year old male with a 40 inch waistline. Do you really think I can't handle the truth? "I say: can you chaps play, 'Nearer My God To Thee'?" I saw the news today. From the minute I was old enough to comprehend that the United States had a two-party system, I have been awestruck at the Dems' capacity to shoot themselves in the foot. At this moment, from my lofty perch in the Canadian Peanut Gallery, I cannot conceive of a larger caliber bullet for the job than Hillary Clinton. My wife has a co-worker in North Carolina who summed up US' voter response thusly: Americans vote for who they like, and if we were to rank the three current candidates in terms of "edge (abrasiveness) factor" there is no contest: the crown goes to Hillary, with McCain cinching up second place. This deceptively simple maxim goes a long way to explaining every presidential race within my living memory (Ford/Carter to the present). Run this theory by a voting Democrat, though, and watch 'em bristle. "The presidency isn't a congeniality contest! You have to consider experience, character, their personal record on major policies, their ability to negotiate, blah de blah." Yeah, well -- keep trying to persuade yourselves of that. If the melange of what it takes to select a presidential candidate truly required such reasonable qualities, Dennis Kucinich would have won by a landslide. But he's not popular enough. He isn't a professing Christian, for one thing. On this and other crucial fronts he shows a damnable incapacity to speak anything but what he truly thinks. Spring brings out the adolescent in me. When the snow melts and the sap starts flowing in the trees, I pull out the old albums I listened to in the carpeted basement rec-rooms of my friends. In the past I've washed windows and waxed the car to the strains of RUSH, Pink Floyd and the ever-present Zep. This year the soundtrack is Billion Dollar Babies (Amazon), continuing my renewed delight in all things Alice. And thanks to Yahmdallah I've reconnected with April Wine. Whenever I think my grade 9 soundtrack has run its course, someone comes along and reminds me of an album that fell behind the stereo. Very nice. My reading habits experience a similar shift. My daughters have become curious about the Batman storyline, so I stopped by a comic shop and picked up Hush. Of course, I can't help but giggle when, after sharing a rooftop smooch with Catwoman, Batman monologs: "Can't you see that our relationship allows for the possibility that I may someday find you ... killed by The Joker?" But I don't want to be too ironic about the pleasure I find in the book. Jim Lee's artwork is dynamite, fun-house material, and Jeph Loeb's storyline parades the usual Arkham Asylum inmates through the pages until Batman figures out "who's behind it all." Moving up the ladder of taste a rung or two, spring usually motivates me to pick up a travel book. On The Road was typical of my younger day, as was Zen & The Art Of Motorcycle Maintenance. The Songlines by Bruce Chatwin was another such. This year I'm returning to Sam Shepard's Rolling Thunder Logbook, a collection of notes and reminiscences of his time on Bob Dylan's Rolling Thunder Tour. The pieces are short and evocative, easy to read between chores or while waiting for my daughter to emerge from her basketball practice. Is there a rock 'n' roll tour like this anymore? After reading Bill Flanagan's tedious account of U2's Zoo TV tour, I suspect the answer is a resounding "No." And finally television: when I'm not watching hockey, I'll be catching up on Dr. Who, just to keep my geek bona fides up to snuff. It's been a while since I checked in on Lynn Viehl, the Paperback Writer. This Friday's post is recycled, but is a mother lode of excellent advice for fiction writer types. Ms. Viehl is that rarity in the publishing world: a successful fiction writer who makes a (very comfortable, by my standards) living at her craft. If she retains any dewy-eyed illusions about publishing, I've yet to spot them. But she does have an admirable and infectious "can-do" attitude which seems to have been strengthened by her "have-done" history. Don't be shy: drop on by and see just what sticks to your ribs. I apologize for the lack of material, but I have my excuses ... erm, reasons. The close of Ringette season coincided with the Stanley Cup playoffs. Sadly, my daughter's playoff hopes were in line with Buffalo's. Of course, the up-side to this is fewer games, less driving, etc. Nevertheless, as with Buffalo players, our family has been dealing with disappointment. The arrival of spring has also brought about the latest crop of funerals. Thankfully none of these deaths have been from my closest circle of family and friends, but they still require physical and emotional attendance. "The age of the singular critical voice is ending -- people prefer the wisdom of a community." So says Patrick Goldstein in a clear-eyed, non-hysterical appraisal of the current critical environment here. "The wisdom of a community" -- I rather like that, even as I lament the disappearance of the platforms that once gave voice to people like Pauline Kael and David Ansen. Egad -- is the future of Rock 'n' Roll truly heritage acts? Follow the money and find out. Both links via ALD. Meanwhile, Metallica and Henry Rollins are putting in appearances to bolster Record Store Day, this Saturday. I don't suppose either of them qualifies as a heritage act ... yet. Speaking of critics and heritage acts, here's Anthony Lane on the latest Rolling Stones cash-grab: "Can you, or should you, forge a movie from a cluster of hot images, and nothing else? I watched this film at an IMAX cinema, and, believe me, there are better things for a throbbing head than a fifty-foot-high enlargement of Ronnie Wood." Theirs is an act whose entertainment value bottomed out for me some 20 years ago, so even though this is ostensibly a Martin Scorsese film I will not be in the audience. Hm. After taking a look at the tomatometer, I do believe I am more firmly on side with Lane's singular critical voice than I am with the community. Whodathunk? I dropped off the "Family Foto" CD at the local mall's photofinishing center, then meandered over to the magazine rack to see what might be of interest. Lo and behold, Monocle was heralding "The great digital resistance movement." I scanned the cover article, which claims that in the field of skin tone alone, digital photos are grotesquely inferior to their analogue (film) counterparts. Digital photos waste a heap of the photographer's time. The disc I dropped off had 150 images on it, culled from just over 900 that had been taken in the last four months. Many of the non-essential photos were pictures of the cats, taken by my daughters; others were simply botched shots of family members growing weary of the digital delay and blinking, or letting their smiles droop. These have to be culled -- but the work doesn't end there. Even the "good" shots seem to require some Photoshopping. Red eye removal, cropping, a little tweaking of the color-balance, perhaps a special effect or two. This is all Gee-Whiz Fun ... the first time or two. It quickly gets to be a chore. Digital photography is an impediment to the photographer's eye. 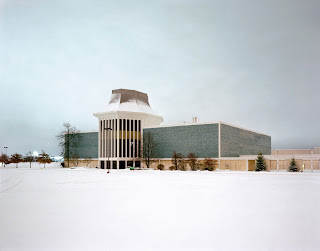 Analogue photography forces the photographer into scrupulousness. If you botch a shot, you waste your money. If analogue is going to work, everybody has to play their best game: the photographer, the subject, the developer. But more than anything, the photographer has to pay attention. Digital photography is so darn flexible, the photographer gets to thinking that even a crappy shot can be salvaged on the home computer. Well, it ain't necessarily so. My trusty old single-lens reflex camera is still in use. And those are the photos my family looks forward to seeing the most. And on this point I shall stop, lest I begin to pine for the lost nights of the family slide show. When I turned on the television I was hoping Ottawa would rally and prove themselves playoff-worthy. In other words, I was predisposed to cheer for the Sens. But Pittsburgh's energy and, dare I say, joy was so infectious I was on my feet when Gary Roberts put in his backhand goal. Normally there's not much fun to be had when witnessing a rout, but last night was the exception. As for San Jose v. Calgary, after last night I'm counting on them taking it to the full seven games -- a very welcome prospect for this viewer. The Spirit Of '76 is available as a podcast. You can download it here, or if you prefer to stream it, go here and press to play. The NHL playoffs are set, which means I'm about to start watching hockey with some regularity. I'll be curious to see how the Senators do -- last year they soared through the playoffs, only to be methodically throttled by Randy Carlisle's Ducks at the very conclusion. Perhaps this bitter defeat, in combination with a signature year (a glorious opening season, followed by a slow erosion to indeterminate status) will generate the sort of character growth they've been missing? The Washington Capitals are worth watching, and I'm looking forward to seeing San Jose and Anaheim play -- two teams whose games are rarely broadcast in this Toronto-centric neighborhood. Speaking of which, I was cheered to see Canada's newsweekly provide this highly amusing bit of analysis: Why The Leafs Stink: What It Takes To Build A Chronic Loser (here). It's a funny question for me to ponder, because I don't know what I'd do if the Leafs began to play winning hockey. Frankly, the current situation couldn't make me happier. The blue and white, which have dominated the airwaves with their dreary dump-n-chase play during the regular season, are completely out of the picture, thus allowing hockey fans (as opposed to Leafs' fans) to watch the game as it's meant to be played. During one of my recent visits to the magazine stand, I experienced a San Francisco flashback — circa 1995, shortly before the original dot-com bubble burst. My wife and I were enjoying an evening stroll in North Beach, having just spent the day taking the 49 Mile Scenic Drive. * We were in front of Vesuvio, sipping the requisite coffee and watching an enormous stretch limo attempting a particularly tight corner. The driver finally had to concede defeat and cautiously back up. “Probably. Maybe I’ll see you.” The kid flopped back in his seat, rolled the window up and instructed his driver to carry on. The limo pulled forward, and took a more reasonable corner. I thought of the kids who had flocked to San Francisco some 30 years earlier, then I thought again of this kid and his flashy compatriots. Such is the behavior of the nouveau riche: unintentionally amusing, if only for its pallid irony, but finally quite maddening if you allow yourself to mull it over long enough (13 years, say). The very rich are not like you or I, and neither are the newly rich — they’re more like a magazine. In this case, GQ. The Gentleman’s Quarterly, in the tradition of most American magazines, holds out an invitation (with a serrated edge) for the consumer to join its exclusive company. The opening pages present cell phones and shaving accessories I can probably afford, then push ahead to music and movies I haven't yet had the chance to sample but are coming soon to a download service near me, before finally moving on to suits of clothing, exotic spas and scantily-dressed girls that are completely out of my reach. Leafing through the magazine I find my reaction is similar to the one I had with the dot-com kid: I might appreciate the original distraction, but I’m finally keen to get it out of my face. I’ll take a deep breath, then go on record and just say it: from 1985 to about 1990 I used to really enjoy reading GQ. Its invitation was more appealing, and the let-down was a little gentler. My recollection of the magazine from those years is the pictures were for kids, while the words were (mostly) for grown-ups. I know I’ve moved out of, and quite likely have never been in, the target demographic, but these days the whole shebang is devoted to kids. But it’s not just this one publication that appalls me, it’s pretty much the whole stand. Where’s a picture-lovin’ word-hungry fella to go for an afternoon’s enticement — Vanity Fair? Lessee, here: we’ve got the watches, the trousers, the Manolo and the movie stars. The encouraged consumption is all a little too conspicuous for this farm boy, but never mind. In the words department, Christopher Hitchens rhapsodizes about blow-jobs and martinis, while Stiglitz and Bilmes tear their robes over the cost of Iraq. Three trillion dollars — isn’t that the yearly retainer for Annie Leibowitz? Talk about a magazine with a split personality. What’s next: Britney Spears on the cover of The Atlantic? Alright, time for another San Francisco memory, this one from our most recent visit. My wife and I were trudging around Pacific Heights, looking for perspectives into people’s yards. The neighborhoods are terraced with long flights of steps that are perfect for exactly that sort of voyeurism, so we climbed up one such, then parked ourselves on a bench and took in the view. Some minutes later I noticed a white-haired gentleman in a black suit at the bottom step. He was a long way down, but as he got closer I could make out other details. He was smoking a cigar, and his suit and sunglasses were almost certainly Italian. Within a few minutes I could smell his cigar, and it was quite fine. When he reached us he nodded at me, then flashed my wife a sharp smile. He opened his mouth and a gravelly Robert Loggia voice came out and said, “How aahh yah?” The man was fit, sharp, charming and alive, and for that one moment the two of us were part of his glorious conspiracy. He went on — to his home, his lover, his job ... who knows? Could be he drove the limo we’d seen ten years earlier. Regardless, the old guy left a sensual impression that got the imagination spinning in delightful directions. 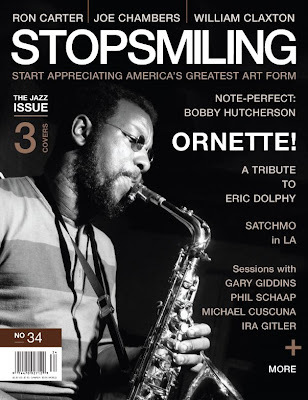 Somewhat like another magazine: Chicago’s own Stop Smiling. If you pick up the current issue, you’ll see it’s devoted almost entirely to jazz, “America’s Greatest Art Form.” Anyone who couldn’t give a toss about jazz will reject the magazine outright, and that’s a shame — not because I’m looking for jazz converts, but because any magazine, regardless of its chosen subject matter, is about delivering an appealing look and read. On this score, SS has yet to fail me: I’ve purchased issues with rap artists on the cover, and though I still make it a point to avoid the music, I’ve enjoyed the magazine. Stop Smiling’s approach has a faint esotericism to it. Where other magazines make their point by assembling an argument and sealing off the exits, SS devotes its pages to personality profiles and interviews, inserts the occasional historic footnote, and closes with a few reviews. All of this is mercifully brief and pleasantly evocative. It makes for a perfect lunch-hour’s worth of reading because it pulls the reader in with its format, which makes the case for an alternate reality that is aesthetically rewarding without being off-puttingly “glamorous.” Like the old gent, it is superficial in the best sense of the word: it invites closer scrutiny. Their official site is here. Seek it out at your magazine stand today. *San Francisco’s 49 Mile Scenic Drive is truly one of that unique city’s great innovations for its tourists. If you’re visiting San Francisco, pick up the Dorling Kindersley Eyewitness Guide and take The Drive — by car is fine, taxi is better, but motorcycle or scooter is the very best. Stretch limousines, however, are to be avoided. They just don’t work.